You've probably been wondering about this for a while: did the Ancient Greeks ever get intestinal worms like we do today? The answer, we can now tell you, is an unequivocal yes. Researchers from the University of Cambridge have examined Ancient Greek human remains from burials on the island of Kea and found evidence of parasites - confirming the writings of Hippocrates 2,500 years ago. 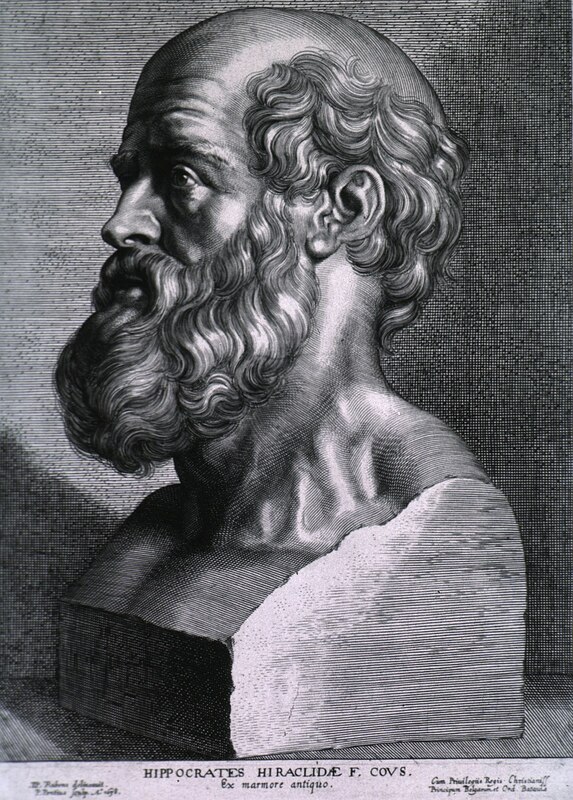 Hippocrates, the famous physician and "Father of Western Medicine" who lived from around 460 to 370 BCE, wrote of many different diseases in the Hippocratic Corpus. Medicine was vastly different back then, and the descriptions of what caused various ailments was often flat-out incorrect ("wandering uterus", anyone?). Of course, it's important to note that this was the first time anyone had attempted to classify diseases based on symptoms, thereby pretty much inventing pathology. For modern researchers, it can be very difficult to match up the writings with known illnesses. But, even if we now know better than to put stock in the four humours as a causative factor for disease, the symptoms themselves were often relatively accurate. These newly discovered worms are a case in point. 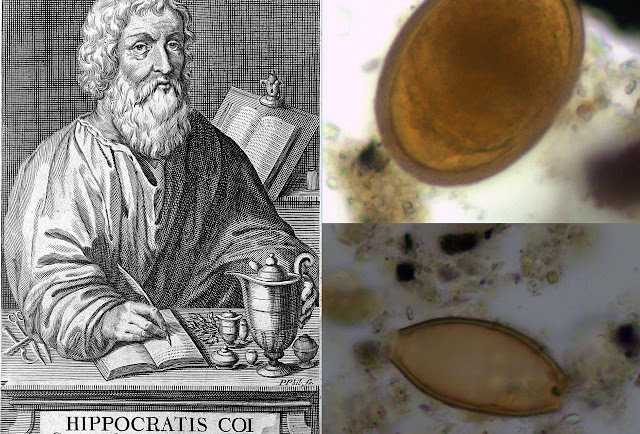 Hippocrates described three types of intestinal parasite and their symptoms. He named them Helmins strongyle, Ascaris, and Helmins plateia - but researchers had to guess which worms he meant, since they had found no archaeological evidence. Now researchers from Cambridge University in the UK have found the missing links in some ancient poo. They examined 25 burials from the island of Kea dating back to the Neolithic (4,000 BCE), the Bronze Age (2,000 BCE), and the Roman era (146 BCE to 330 CE). More specifically, they examined the dirt found on the pelvic bones of the skeletons - made up of the faecal waste that had decomposed in the deceased people's guts. They also tested soil samples found at the feet and skull as a control to make sure any parasites found did belong to the intestines and not just the dirt in which the bones were buried. Four of the burials tested positive for intestinal parasite eggs: one Neolithic, one Bronze Age, and two Roman. "The Helmins strongyle worm in the ancient Greek texts is likely to have referred to roundworm, as found at Kea. The Ascaris worm described in the ancient medical texts may well have referred to two parasites, pinworm and whipworm, with the latter being found at Kea," said senior researcher and Cambridge archaeologist Piers Mitchell. "Until now we only had estimates from historians as to what kinds of parasites were described in the ancient Greek medical texts. Our research confirms some aspects of what the historians thought, but also adds new information that the historians did not expect, such as that whipworm was present." Previous research proposed that Helmis strongyle referred to roundworm, Helmins plateia referred to flatworm, and Ascaris referred to the pinworm. Symptoms included in the Hippocratic Corpus included weakness, vomiting (and vomiting worms), diarrhoea, tiredness, fever and shivers, changes in appetite, heartburn and a swollen abdomen. In one notable case, Hippocrates described a boy with a fistula in his stomach, from which "a thick helminth came out from there, and he said that from then on whenever he had a fever, bilious material would exit from that opening." 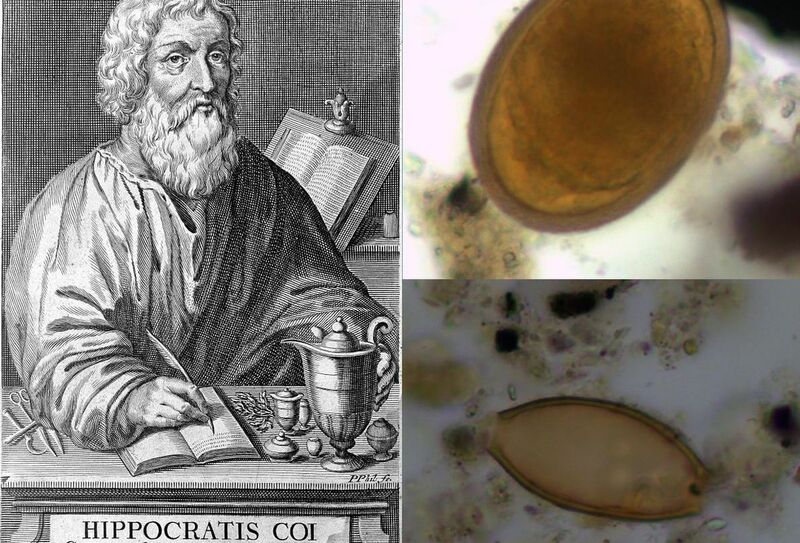 The finding represents the earliest archaeological evidence for intestinal parasites in Ancient Greece, and the first archaeological evidence for what Hippocrates described. "This research shows how we can bring together archaeology and history to help us better understand the discoveries of key early medical practitioners and scientists," Mitchell said. The paper has been published in the Journal of Archaeological Science: Reports.